Pushing the boundaries: BBC, Marie Claire and BrewDog all spoke up for equality in the workplace. To highlight the disparity in pay, BBC’s female staff stopped working at 4:22PM, the time when they stop getting paid compared to male colleagues. BrewDog also addressed the issue of pay inequality by launching a “new” Pink IPA, a spin-off of its famous Punk IPA. They charged women 20 percent less for the beer, donating 20 percent of the proceeds to causes that support equal pay. 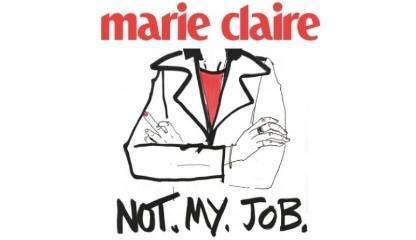 Marie Claire advocated for genuine equality in the workplace for women from all backgrounds by launching a new campaign in partnership with illustrator Laura Quick. The #NotMyJob campaign called on the magazine’s audience to share their experiences, which were turned into a series of pictures that “flip the finger” on harassment. In addition to the illustrations, the magazine partnered with a law firm to provide legal advice to its readers who have experienced discrimination. Playing it safe: Nike, The New York Times and Wikipedia all took an inspirational approach to celebrating women. Nike created an ad featuring Serena Williams and the obstacles she overcame to become the iconic athlete she is today. The New York Times published obituaries for 15 remarkable women they had overlooked since 1851. To provide more and accurate information for web searches, Wikipedia hosted an edit-a-thon dedicated to improving content on feminism and gender. Missing the meaning of progress: McDonald’s and MTV both altered their logos for the day, turning the Ms upside-down to represent Ws. Consumers were quick to point out the lack of authenticity in both efforts. McDonald’s was criticized for failing to pay its workers a meaningful wage – causing some of its women workers to face poverty and homelessness. Rather than making changes to its logo, Mattel re-designed its iconic Barbie, creating a range of dolls inspired by women who are good role models. While all the dolls offered a range of strong women to look up to, the dolls were all thin – missing the mark on body inclusivity and true diversity of women. With the groundswell of support and expectation from consumers, companies are eager to join the conversation about women’s empowerment – but as this movement evolves, so must the ways companies engage on the issue. As we learned last year with “Fearless Girl,” consumers are willing to do research to ensure a company’s stance on the issue is authentic – that they are walking the talk. This year, consumers are demanding real progress. It’s no longer enough to acknowledge IWD with moment in time activations or feel-good campaigns, but instead to back those campaigns with business practices that support equal rights. This article originally appeared on Cone Communications and was distributed by 3BL Media.